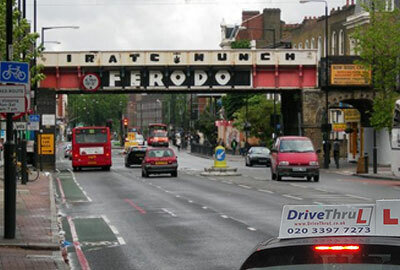 Driving School in Bow (E3) East London borough of Tower Hamlets. We at DrivethruL Driving School have qualified driving instructors who can provide driving lessons in an automatic or manual car. Our professional and dedicated driving instructors will provide you driving lessons in their fully fitted dual control cars so you can enjoy driving knowing you are in safe hands. Learning to drive in and around Bow will be quite a learning experience. Famous and known landmarks can be seen and driven by as the location of Bow is in the heart of the East End. You may drive past the Olympics Stadium or drive through Roman Rd E3. Driving in Bow will take you into Stratford which is the adjacent Borough of Newham, E15. Wherever you drive, which ever route you take you will surely enjoy the surrounding of the busy city life around you. If you live in the Bromley by Bow or Bow area you may know that there are a lot of busy roads too such as the A12 leading to the Blackwall Tunnel, Canary Wharf or the Bow Roundabout, not far from the Bromley Public Hall. For learners these routes may seem scary but rest assured, once you learn how to drive with our driving instructors you will breeze through the East London roads in no time. It has a lot of side roads which gives you the opportunity learn your manoeuvre’s and gain confidence. Learning to drive also can be fun, challenging and very rewarding! When you are ready and able to follow the sequence of P.O.M (Preparation, observation, manoeuvre) you will then learn the sequence of M.S.M (Mirror, signal, manoeuvre). It is important that our pupils feel confident when they start driving onto bigger roads with more cars around. Our driving instructors know the routes through the in and out of Bow which is also known as E3. Driving Lessons at your convenience! DriveThruL Driving School regularly have special offers which are updated. We offer block booking packages or pay as you go prices. You can take advantage of booking these lessons as an hour or two sessions. We provide driving lessons from morning till late evening including weekends at no extra cost! We know city life can be hectic with work, college and different life style. To make sure everything is nice and organised for you we take your bookings to suit your time and availability. Our driving lessons are structured to your driving needs, to make learning to drive enjoyable. If you are not clear on what's involved in learning to drive please contact us about driving lessons. If you would prefer to speak to someone call us on 020 3397 7273 or 07790 820 820.